Four hundred fifty years old colonial house, located in San blas artists barrio, beds from 12$ (backpacker service); the hostel service is designed like a 3 stars hostel, 24 hours hot water, we have a huge Underground water tank and our showers are heated by gas; Our beds, comfortable mattress and feather covers, with nice view of the city also from some of the rooms. 24 hours door attention, cable tv and dvd in each room (movies collection). The house atmosphere is quiet but fun, very dynamic we offer you all kind of tours, BIG CAT OPERATOR is our tours agency. other of the specialities of the house is plants therapy. we invite to join us in your trip. We also have adventure tours, off road crossings, motorcycles & ATV tours. Beds from 12$ (backpacker service); the hostel service is designed like a 3 stars hostel, 24 hours hot water, we have a huge Underground water tank and our showers are heated by gas; Our beds, comfortable mattress and feather covers, with nice view of the city also from some of the rooms. 24 hours door attention, cable tv and dvd in each room (movies collection). San Blas is a bohemian neighborhood with small bars and live music at night. is quite calm and quiet because not many cars in the area. some areas of San Blas are built on Inca terraces, and much of the art of Cusco is located in these streets. 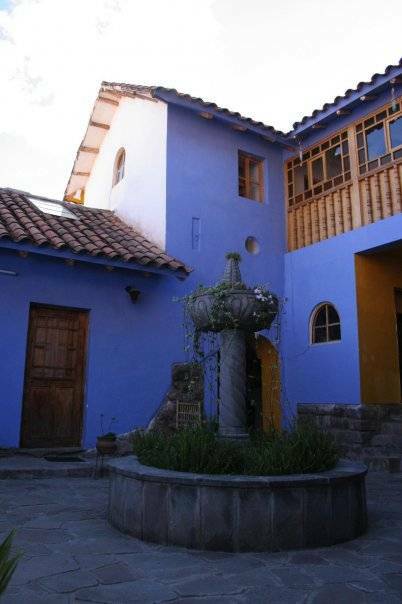 Located at 4 blocks from the main square, 1 block from San Blas square, from ther following the road to Sacsayhuaman, Tandapata 172.